Ozone (O3) is Mother Nature’s gift for safer, more effective sanitation. It readily decomposes into oxygen and leaves no harmful residues, by-products, tastes, or odors, and thus does not require a final rinse. Ozone offers many benefits as a disinfectant. It acts on contact to eliminates 99.999% of all bacteria, viruses, and molds, thereby removing the chance of biofilm and slime from forming in the first place. Its bacterial disinfection mechanism works by oxidizing the bacteria cell wall and membrane, causing cell lysis and impairing cell functionality. Bacteria and microorganisms cannot build a resistance to ozone. Ozone exhibits a short half-life before reverting back to oxygen, its only by-product, and leaves behind no residue. 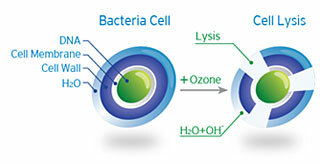 Ozone is US FDA approved for direct food contact and is the most effective and safest disinfectant available. In 1991, the US Environmental Production Agency (EPA) confirmed that ozone is the most effective primary disinfection available for drinking water. Ozone has 3,125 times stronger disinfecting power on bacteria and virus compared with chlorine and ozonated water has 50+ times stronger than chemical bactericidal agent such as chlorine bleach. 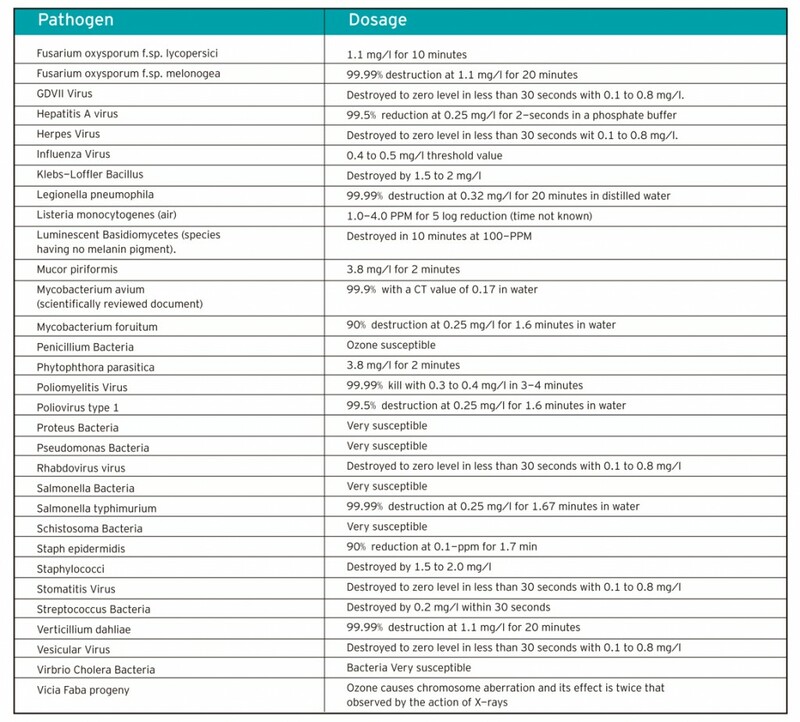 Biotek 2 ppm ozonated water can kill 99.999% tested bacteria within 5 to 15 seconds as shown in SGS report. The required concentration is far less than chemical bactericide such as chlorine that requires 100+ ppm of chlorine for normal disinfection and up to 1,000 ppm for medical disinfection. Thus, using Biowell Ozonated water can prevent bactericidal chemical residue problems and have advantage of cost saving on water for rinsing and prevent re-contaminated of disinfected materials by bacteria containing water. All bacteria and viruses are composed of carbohydrate, protein, RNA and DNA. For structure of protozoa and bacteria, all cell organs are surrounded by cell wall and cell membrane. Ozone molecules in ozonated water have high oxidation potential and oxidize cell components of the bacterial cell envelope which is a consequence of cell wall penetration. When ozone has entered the cell, it oxidizes all essential components (enzymes, proteins, DNA, RNA). This mechanism differs from that of halogens (such as chlorine), which are usually applied. Chlorine is known to penetrate cells by diffusion. 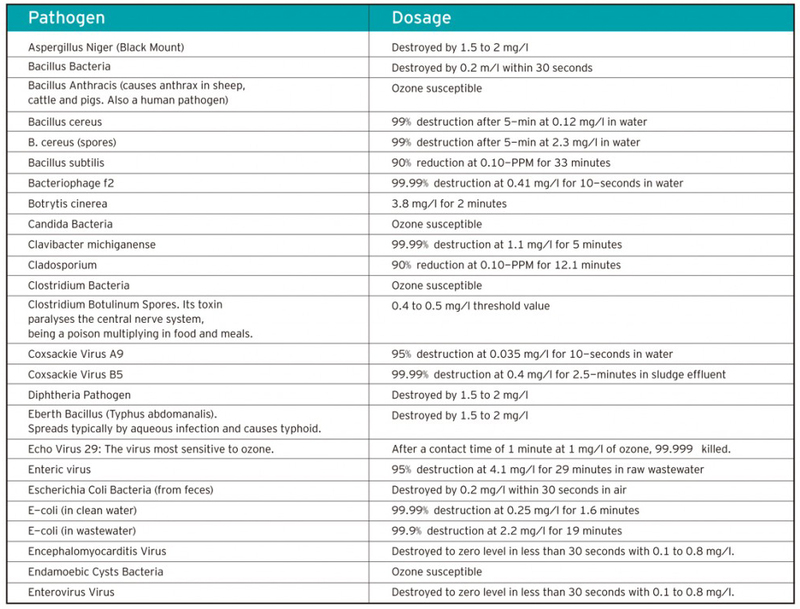 Within the cell, chlorine affects several enzyme types. When ozone has entered the cell, it oxidizes all essential components (enzymes, proteins, DNA, RNA). This mechanism differs from that of halogens (such as chlorine), which are usually applied. Chlorine is known to penetrate cells by diffusion. Within the cell, chlorine affects several enzyme types. Mudd JB, Leavitt R, Ongun A, McManus T: Reaction of ozone with amino acids and proteins. Atmos Environ 1969;3:669-682. Ishizaki K, Sawadaishi D, Miura K, Shinriki N: Effect of ozone on plasmid DNA of Escheria coli in situ. Water Res 1987;21(7):823-828. Cech T: RNA as an enzyme. Scientific American 1986 Nov;255(5):64-76. Roy D, Wong PK, Engelbrecht RS, Chian ES: Mechanism of enteroviral inactivation by ozone. Appl Envir Microbiol 1981;41:718-723. Riesser V, Perrich J, Silver B, McCammon J: Possible mechanimsm of poliovirus inactivation by ozone, in Forum on Ozone Disinfection. Proceedings of the International Ozone Institute. Syracuse, NY, 1977; pp. 186-192. Bacteria are microscopically small, single-cell creatures having a primitive structure. The bacteria body is sealed by a relatively solid-cell membrane. Ozone interferes with the metabolism of bacterium-cells, most likely through inhibiting and blocking the operation of the enzymatic control system. A sufficient amount of ozone breaks through the cell membrane, and this leads to the destruction of the bacteria. Viruses are small, independent particles, built of crystals and macromolecules. Unlike bacteria, they multiply only within the host cell. They transform protein of the host cell into proteins of their own.